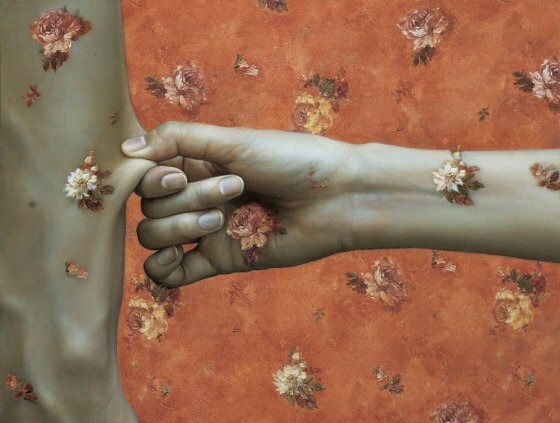 Zhao Fang’s art is a fistful of contradictions. He juxtaposes physical and social conflict, which are so realistically rendered they appear to be almost photographic, with an undercurrent of harmony and delicateness. His subjects are often depicted practicing Kung Fu and are captured in a moment of torsion. He distinguishes the passive from the aggressive through the use of light and shadows, painting the skin of the former in a brighter tone and the latter in a darker. In another series, he also explores the tensions between Eastern and Western culture, by centring in on the arms of two figures holding antithetical weaponry, board games and eating utensils. His dramatic stills are presented from a magnified perspective: a pointed finger jabbing into skin, a hand covering another man’s face, aclenching fist landing on a chin. Fragments, rather than the entirety, of the action are shown to create a sense of timelessness, detachment and anonymity for the aggressor and victim. 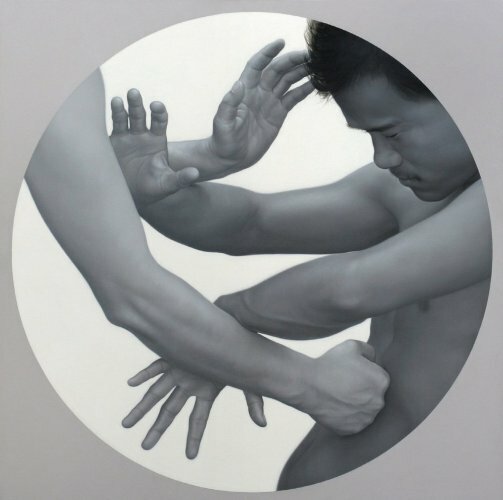 The composition and its dynamics trigger the viewer to question whether the aggressor is acting as a result of offensive or defensive purposes. Zhao Fang uses this to challenge the idea of the victor, instead focusing on the complexity and subtlety that is often left hidden behind relationships. This anti-violence stance is undoubtedly influenced by his personal experience in the People’s Liberation Army.